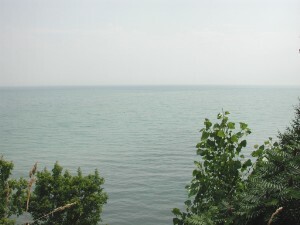 Lake Erie is one of the five Great Lakes of North America. It is the warmest of them all. While temperatures have reached as high as 29°C water temperatures generally ranges from 21°C to 24°C during the summer months. On the basis of surface area, it is the fourth largest great lake covering an area of 25,700 square kilometers. On the basis of volume, it is the smallest as it holds 116 cubic miles of water. It touches four U.S. states including New York, Pennsylvania, Ohio and Michigan and the Canadian province of Ontario. Total length of Lake Erie is 388 kilometers and at its widest point, it is about 92 kilometers wide. The French trader and explorer Louis Jolliet was the first European to record this lake in 1669. It was the last of all the Great Lakes to be explored by Europeans. Lake Erie consists of total twenty four islands and nine of which belong to Canada. With an average depth of 19 meters, it is the shallowest of all the Great Lakes. It has a maximum depth of 64 meters. This lake is home to one of the largest commercial freshwater fisheries in the world. They boost the economy by more than $1 billion annually. It was one of the first Great Lakes which was uncovered during the last retreat of the glacial ice. Approximately 34 inches of water evaporates from the lake surface every year.